A number of families have owned this property over the past century, but it commonly is referred to as The Cark House after the family who occupied the home from 1893. At the time, the home was the showplace of Valley Center and the setting for many social events and soirees. A Civil War soldier, George Herbst, homesteaded at this site on 160 acres, and built a modest house in 1870. He lived here until his death in 1883. The executor of Mr. Herbst’s estate, the Rev. John Henry Sherrard, claimed 142 acres of the land for himself and his wife Hannah, and built a new adobe house at the site. Heavy rains of 1883-84 caused the adobe to begin to melt, so Rev. Sherrard had the exterior covered with red clay bricks. His initials, JHS, are seen above the door today. When Mrs. Sherrard died in 1893, her husband sold the property to the family of Dr. James Harrison Clark, a physician who made house calls by buggy or horseback. The Clarks called their ranch, “Glenn Alpine” and it was a popular social gathering place. In 1905, the Clarks sold the property to Arthur Miller whose family operated a dairy in the area for many years. By 1933, the street officially took on the name Miller Road. The 140-acre property was sold by the Millers in 1941 to geologist and mining engineer William E. Tizard and his wife Agnes, a home economist. They called the ranch “Deer Stream” because of the deer in a canyon behind the house. The Tizards made significant improvements to the house including electricity and indoor plumbing. Starting in the early 1920s, Mrs. Tizard (then Agnes White) took on the persona of the character “Betty Crocker”. 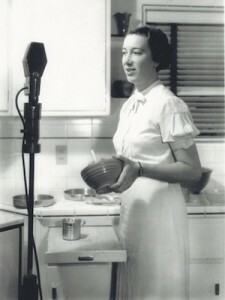 As Betty Crocker, Agnes White hosted the country’s first radio cooking show, appeared in magazine advertisements, and developed many recipes for the company that became General Mills. She built a stainless steel demonstration kitchen in her Valley Center house. After the death of Mrs. Tizard in 1979 at age 84, Mr. Tizard gave the house and surrounding acreage to Brigham Young University in Provo, Utah, in exchange for an annuity. He died in 1981 at age 85. During the next decade, the house was rented to several families, including Tom and Susan Elm, who purchased the house in the 1990s. 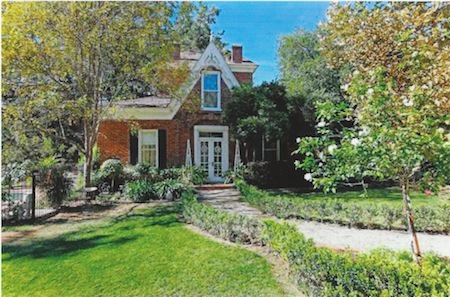 They sold the property in 2000 to Keith Alen and Marla Wheeler who restored the house. The Wheelers use an adjoining 3,000 square foot barn, which also dates to the pre 1900 era, for an antiques business. The house sites on an 8-acre parcel.